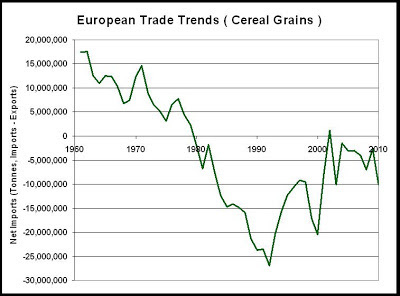 Applied Mythology: Should the World Keep Feeding Europe? Western Europe is a major net importer of food averaging 59 million metric tonnes during the years 2001 to 2010. That amount is similar to the net imports of all of Africa - a region with 2.5 times as many people. On a per capita basis that represents 139 kg or 290 pounds per person per year. Global food demand is expected to require a 60% increase by 2050, and it will be a major challenge to meet that demand. Europeans will be increasingly competing with poorer, import-dependent nations. Of course my question about feeding Europe is merely academic. As long as their money is good (at least in some form), they will be able to buy in free markets. As prices for commodities continue to rise, the richest regions will have the greatest capacity to pay. The reason that I raise this question is that Europe's role in the global food supply is more complex than simply being a big, relatively rich customer. Through a range of actions, policies, threats, societal preferences, activism and post-colonial influence, Europe has profoundly affected the supplies of food around the world. In many instances, that extramural influence will continue to make it even more difficult to meet rising demand for food. This is not just a question of economics. It is an ethical question with ramifications for global political stability. This is a discussion which needs to happen before significant food shortages occur. Europe is actually a very productive agricultural region. It is home to many highly sophisticated farmers. However, there are a number of regulatory constraints that prevent some of those farmers from being as productive as they might be. Only a few European countries have allowed their farmers to benefit from advances in crop biotechnology. Their animal producers are not allowed to use hormone supplements that improve feed-use-efficiency. Low yielding organic production has been encouraged in several of the countries. Europe may ban the use of neonicitioid insecticides as seed treatments without clear evidence of their primary role in honey bee colony collapse disorder. The ban could diminish yields in the large rapeseed, oil crop. With some policy changes, European farmers could be more productive. 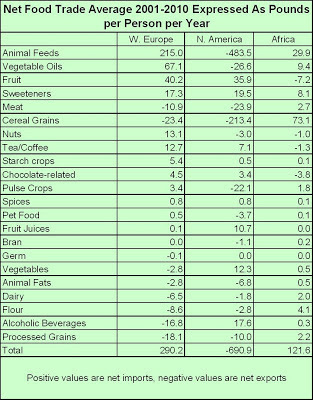 Europeans eat a lot of meat and dairy foods, probably more than is ideal for their health. 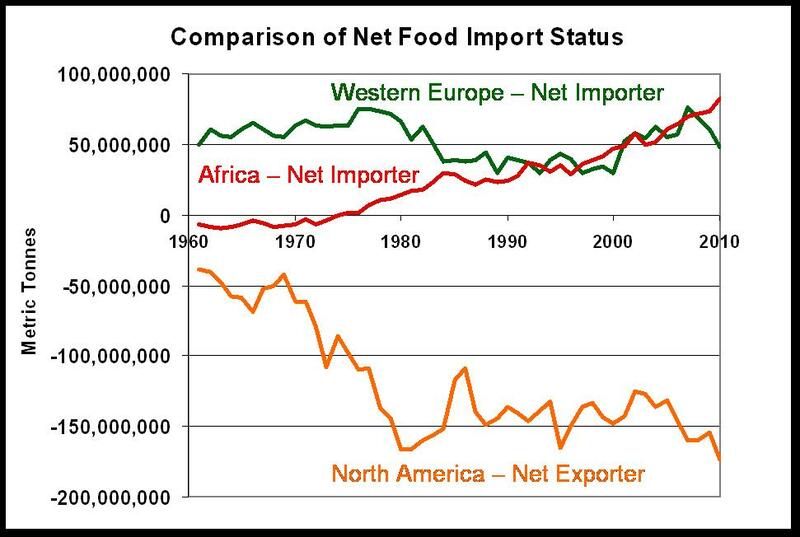 The largest share of net food imports to Europe is of crops for animal feed like maize and soybeans (net 215 kg/person, a total of 40 million metric tons - twice the net feed imports to all of Africa). Ironically these are primarily GMO crops from the Americas. 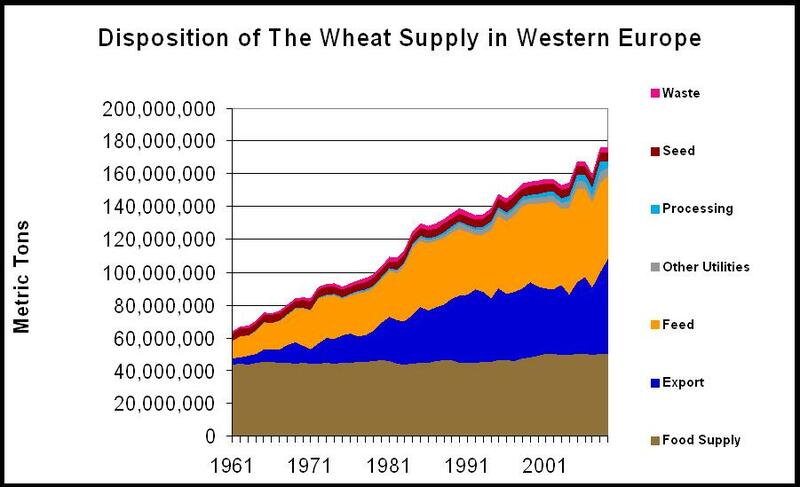 Europe also uses a substantial proportion of its wheat supply as animal feed (31% on average from 2000-2009, 47 million metric tons, 1.3 times as much as the total wheat imports to Africa in 2010.) 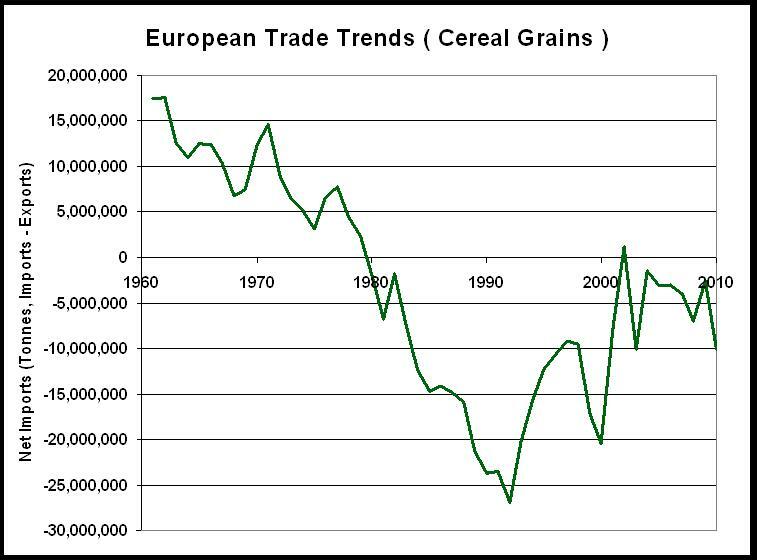 Western Europe was once a significant exporter of cereal grains such as wheat, barley and rye, but in recent years net exports have contracted and more and more of the crop is now fed to animals. The title of this post could have been, "Should the World Keep Feeding Europe's Animals?" Economist and Political scientist Robert Paarlberg of the Harvard Kennedy Center wrote a book titled "Starved for Science: How Biotechnology is being kept out of Africa." In it he documents how post-colonial influence from Europe has driven regulatory decisions in many African countries so that they have a European-like hesitancy about GM crops. Many don't even allow any field testing. Since Africa will be the center of most global population increase over the next several decades, this projection of what Paarlberg terms "rich world preferences" is certainly at odds with Africa's need to produce as much of its own food as possible. This is particularly unfortunate because biotech crop improvements are "scale neutral." They work just as easily for a 2,000 acre farm in Iowa as a 1 hectare farm in Africa, and in many cases they would be offered for free. African farmers would very much like to have that opportunity. Europe has also reduced its investment in international agricultural research which further compounds the problem. Europe is also very slow to approve of new biotech events for the GMO crops that it does import, causing logistical problems in the grain trade and often interfering with the hybrids and varieties New World farmers can utilize. Technically, food in Europe has to be labeled if it contains GMO ingredients. In practice, food companies use ingredients from non-GMO crops at higher cost to avoid having to bear a label which would be unpopular with their consumers. In 2002 there were GMO wheat varieties approaching the market in the US and Canada, one from Monsanto and one from Switzerland-based Syngenta. The later was particularly interesting because it would have reduced the risk of a mycotoxin in the wheat supply. Even though Europe is a major producer of wheat (~100 million tons/year), it imports substantial quantities of durum and hard red spring wheat from North America because of the high quality of the grains (about 3 million metric tons in 2010). The major wheat importers of Europe (and also Japan) threatened to stop all purchases of North American wheat as soon as there was any commercial planting of GMO varieties. Unwilling to risk losing this lucrative market, the Canadian and US wheat grower associations asked Monsanto and Syngenta not to go ahead with their commercialization plans. The termination of those programs reduced the overall private investment in this crucial crop and global production trends have slowed while production of GMO crops has increased more rapidly. The wheat industry now regrets having given in to these big customers, and wants to see biotech wheat as a future option. Since then, the Australian, Canadian and US wheat grower associations have all pledged to do a simultaneous launch of biotech wheat, when and if it becomes available so that they cannot be blackmailed in this fashion. In the mean time, Europeans have used their market leverage to effectively slow the improvement of one of the world's most important food crops by decades. Although the anti-GMO movement is globally distributed, it began earliest and with greatest intensity in Europe. This is not because European scientists have a different opinion about the risks of improving crops with biotechnology - they agree with the broad consensus that they represent no unusual risk. But as previous activist Mark Lynas admitted, the movement didn't even know much about the science. Their sort of fear-mongering has influenced other nations around the world as with the case of Bt Brindal (eggplant) in India, and the long delays in the deployment of Golden Rice. The European anti-biotech movement is particularly prone to destructive vandalism and severe irrationality. Perhaps the most dramatic example was when activists destroyed a government sponsored field experiment with a Fanleaf Virus resistant grape rootstock trial in Alsace. The activist's concern about "genetic contamination" was absurd for a crop that isn't grown from seed anyway and for a rootstock which is only under the ground. Reason has no role in this phenomenon. Europe is also a source of much "junk science" attempting to design experiments that will "prove" that GM crops are dangerous. Real scientists in Europe are forced to discredit such efforts as they did with particular force in the case of the notorious Seralini study, but it has become a "Whac-a-mole" exercise, and the disinformation spreads. 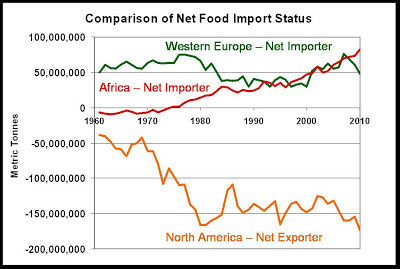 Western Europeans have an influence on the global food supply that goes well beyond simply being a major customer. They have interfered in a variety of ways with how farmers around the world can farm. The influence has important ramifications for all consumers around the world. To be fair, the substantial investments by European-based agricultural technology companies like Bayer, BASF and Syngenta are making extremely valuable contributions to global food productivity, but all of those companies have moved their biotechnology efforts to more science-friendly countries. I'm sure that the world will keep feeding Europe and its animals. I'm less sure that will be fair to the poorer, import-dependent people of the world. All figures based on FAOSTATS data. I have posted a complete slide set on this topic on SCRIBD and would be happy to email it to anyone interested. You are welcome to comment here and/or to email me at savage.sd@gmail.com. 1) Do you think that GMO, hormone supplements and neonicotinoids seed treatment are enought to fill the gap of productivity? 2) Some country in Europe are already highly productive and still net exporter despite their fear of GMO. Hungary recently burned and plowed under GMO corn fields, and it is a net food exporter. Romania was a net exporter of some crops and benefited greatly from Bt potato against the Colorado beetle. They became net importers in 2007 and their pesticide use quadrupled. That was the year they joined the EU. No, I think that if Europe really wanted to take themselves out of the competition for food, globally, they would need to moderate their animal protein intake. I'm quite a carnivore myself, but I think lots of people like me could just reduce our consumption a bit and it would make a big difference. Also, Europe if getting much older now because of their very low reproductive rate. Old folks like me don't need so much protein. I agree. Some European countries are very productive. Of course one of Europe's major exports is alcoholic beverages. I enjoy those too, but that isn't really how one feeds the world. They have an amazing greenhouse vegetable industry, particularly in Spain. Their wheat production is about the best in the world, but it seems strange to still import so much and to use so much for feed (for most countries the percentage of feed wheat is more like 10%, not >30%). But just as an example of the craziness, Europe is a huge producer of potatoes. Their farmers battle a disease called Late Blight and have to make dozens of fungicide sprays a year to protect the crop. These are not nasty chemicals, but it is expensive to do this. European, academic researchers have moved some genes from wild potatoes into commercial potatoes to make them resistant to this disease. To do that with ordinary breeding would be extremely difficult since potatoes don't normally reproduce by seed. The anti-GMO forces of Europe have come out completely against this. Does this make any sense? My guess is that this technology will never be commercialized in Europe. This is the sort of insanity that raises ethical issues. Shades of Fifth Century CE when Africa was feeding both halves of the Roman Empire. When the Romans were defeated and expelled from their bread basket the Western Empire easily fell and their empire crumpled. The Eastern portion of the Empire was able to adapt and lasted nearly 700 more years. Poor Norman Borlaugh must be spinning in his grave. He did so much to feed this part of the planet with improved farming methods. I have debated Europe's unwillingness to utilize GMO foods with many people in agriculture and there's a general consensus that "politics" is the prime motivating factor behind their reluctance. Environmental activists, who have their own hidden agendas, continue to exert intense political pressure, thereby unduly influencing the debate surrounding GMOs, hormone supplements and neonics. As you state above, this issue is "not irrelevant." On the contrary, as I see it as the population continues to grow, and more people begin starving in Africa and beyond, governments will have no option but to accept science and open the gates to more food production via the use of GMOs. It's inevitable, in my opinion. I have two concerns regarding GMO, perhaps someone here could address them. How do the patents effect farmers when there is cross pollination? Is it not potentially dangerous to displace plants going through the process of natural selection? With hybrid corn, cross pollination is a non-issue because the hybrid seed is purchased every year and has been since the 1930s. Canola is also hybrid. Perennial crops are not grown from seed anyway. Soybean used to be a partially saved seed crop, but if a farmer that didn't plant GMO seed got some small level of cross pollination it wouldn't have been enough to even notice and certainly not enough to be able to spray the next generation and have it be herbicide tolerant. The only legal issues came up when someone intentionally tried to get around the license agreement and even that was rare. Farmers and those that specialize in seed production have always had to deal with cross pollination issues through isolation etc. As for interfering with natural selection, that is what farmers have been doing for thousands of years - using their own selection pressure to get the crop they want. Humans have made profound changes in most of the species we cultivate as crops - they look nothing like their ancestors in many cases. We have all benefited from this process. All that genetic engineering changes is that we know more precisely what is being changed. How was that a defense of colonialism? SD, from your slides on SCRIBD I understand that you aggregated trade figures for the group of countries you call "western europe". Since this is not a group that FAO calls Western Europe, did you sum exports and imports for each of the countries separately and then report the final aggregated figure? If so, did you account for trade between the countries within your group of 'western europe' countries? This group of 30 countries you call ‘western europe’ has an average annual income you calculate to be close to that of North America ($34,828 vs. $39, 391). I can’t find these numbers, but I would guess that the US and Canada are well above this and Mexico is well below. In any case, the US and Canada are well above many of the countries you include even if they were on the North American average; e.g., Albania at $4020, Montenegro at $11,256, Bosnia and Hertzegovina at $10,440, Croatia at $16,620, Estonia at $12,828, Serbia at $8,976, Slovenia at $24,132 and Portugal at $17,544. It is the extreme high earners such as Norway at $77,148, Denmark at $79,536 and Switzerland at $81,936 that make the group in any way comparable to North America. I am wondering if we learn much by comparing mainly the US and Canadian incomes (2/3rds of the average for North America) to mainly ‘eastern european’ incomes, especially since I would expect such poor countries to have much more limited access to education and other resources that could make the difference between a food secure and exporting country and a food insecure importing country. Focusing on like for like comparisons, France (2010) for example is the second largest single country exporter of cereals and wheat behind the US, and the fourth largest exporter of maize, but has only 11% of the arable land available to the US. Although many times smaller than the US, the wealthier European countries are comparable exporters of things like wheat and corn. The Netherlands exports 38% of its wheat crop, France 52% and the US 46%. The Netherlands exports 70% if its corn crop, France 47% and the US only 16%. By my calculations, countries of comparable wealth in Europe are doing as much (e.g. 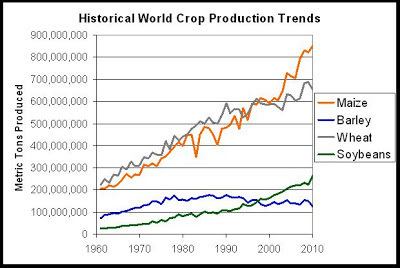 wheat) or way more (corn) per production area to feed other countries (or their animals) than is the US. by god. i like this post. Population density will factor here as well. 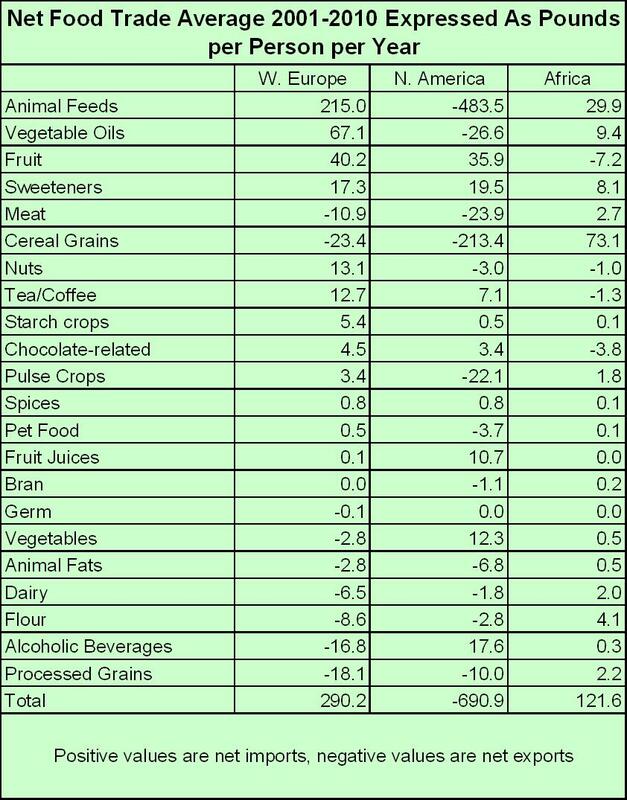 Japan is a net importer of foods & feeds (has been for a long time). Should the same consideration be leveled against the Japanese? And what of the various states here in the U.S. I'm guessing the states of New York and Massachusetts are net importers of foods/feeds. Cut them off? Rural New York produces lots of corn, veges, milk... so the locals outside of the big city might want to object to this treatment. Where does one draw the line?